The text of the bill as presented to The House of Commons as a Private Members Bill on 19-Jun-2013 by James Wharton MP. 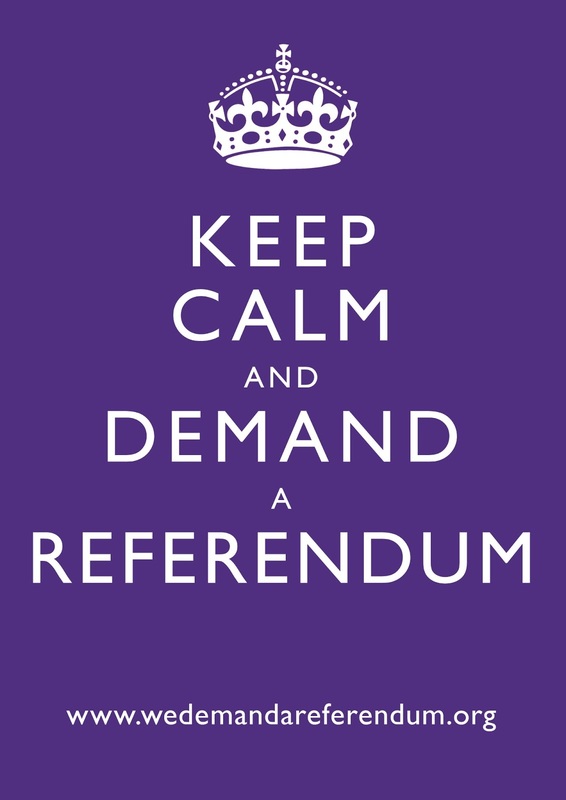 Make provision for the holding of a referendum in the United Kingdom on the United Kingdom’s membership of the European Union. on the United Kingdom’s membership of the European Union. (6) In Wales, a Welsh version of the question is also to appear on the ballot papers, as provided by order. (a) the persons who, on the date of the referendum, would be entitled to vote as electors at a parliamentary election in any constituency, and(b) the persons who, on that date, are disqualified by reason of being peers from voting as electors at parliamentary elections. An order under this section shall be made by statutory instrument and may not be made unless a draft of the order has been laid before, and approved by a resolution of, each House of Parliament. (1) There shall be paid out of money provided by Parliament-(a) Any expenditure of the Secretary of State in consequence of this Act; and(b) Any increase attributable to this Act in the sums which under any other Act are payable out of money so provided. (1) This Act may be cited as the European Union (Referendum) Act 2013. Benedict Brogan is the Daily Telegraph’s Deputy Editor. And they’re off. James Wharton publishes his referendum Bill today. He’s chosen to produce it in its full form for First Reading rather than as a draft. The European Union (Referendum) Bill ‘Makes provision for the holding of a referendum in the United Kingdom on the United Kingdom’s membership of the European Union’. It’s been tightly drawn – it covers just one side of A4 – and keeps it simple. The question on the ballot paper would be: ‘Do you think that the United Kingdom should be a member of the European Union?’ Mr Wharton has done lots of work and consulted widely. Downing Street has been helpful, and so have the Whips – John Randall is taking charge of that side of things. The choice of sponsors is telling: he’s gone for a spread of interests, geographical areas and influence: Guto Bebb, Cheryl Murray, Sir Tony Baldry, Dr Liam Fox, Sir Gerald Howarth, Jackie Doyle-Price, Zac Goldsmith, Nigel Dodds, Bill Cash, Graham Brady and Stephen Dorrell. Intriguingly, David Cameron and William Hague were keen to be sponsors (the maximum allowed is 12, including the Member in charge) but were told by the Clerks and the Speaker that this would make it a Government Bill. Second Reading is Friday July 5. Labour and the Lib Dems are expected to abstain, so it should sail through. Betting is about 15 Labour MPs will turn up to support it, as will a number of Lib Dems. It then goes into Committee, probably on July 17. The trick is to get it out of committee quickly before it can be overtaken by other Private Members’ Bills and timed out. Mr Wharton is confident he can. The crucial next step then is Report stage on November 8, when the wrecking attempts will begin in earnest. The Speaker can group amendments tabled to drown the Bill, but Mr Wharton and his supporters are limited to two closure votes to keep debates on track, so it will require fine management. It would then head for its closing stages a week later. The betting will be that Ed Miliband will dearly want the Bill to be talked out or otherwise wrecked before Labour is confronted with a final vote on the principle. We should expect therefore all manner of operations designed to kill it in Report stage, either by those who oppose it on principle, or those working on behalf of the Labour leadership to spare Mr Miliband embarrassment. The same must be true for Nick Clegg, who is smart enough to know that whatever his views on Europe, being caught opposing giving voters a say is a bad line to take in 2015. Fear of being exposed as an obstacle to a popular vote on EU membership may drive Messrs Miliband and Clegg to all manner of skullduggery (that said, they could flip the other way and go along with it to neutralise the issue, and hope that it will make no difference to the chances of a Lab-Lib coalition after 2015). Chances? Of getting through the Commons – better than evens I reckon, but with plenty of opportunity for disaster. As for the Lords the assumption it will die there, but not before its central purpose will have been served: to identify the persons and parties who want to deny the British people a say. Previous Previous post: BILDERBERG Delegates 06-09-Jun-2013 Watford, UK.